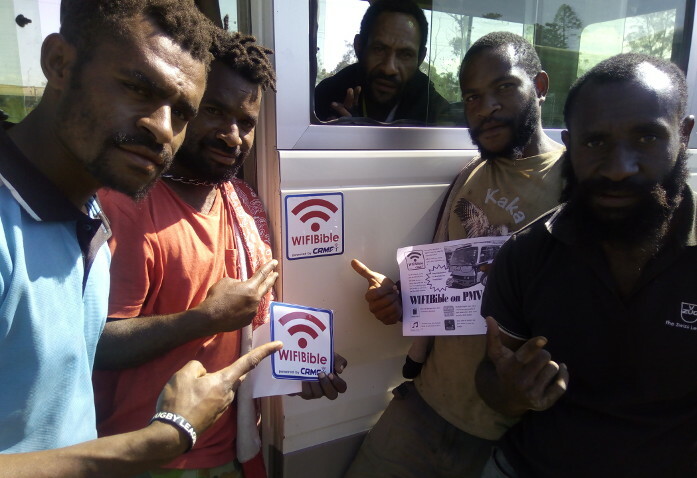 The owner of the Goroka based Gogirox Bus Service which does the Goroka Lae Goroka route on the main Papua New Guinea highway was so glad that a CRMF team turned up to install WIFIBible on public buses. MAF Netherlands has purchased twenty 12 volts WIFIBible devices to be installed for free on 20 PMV Buses. 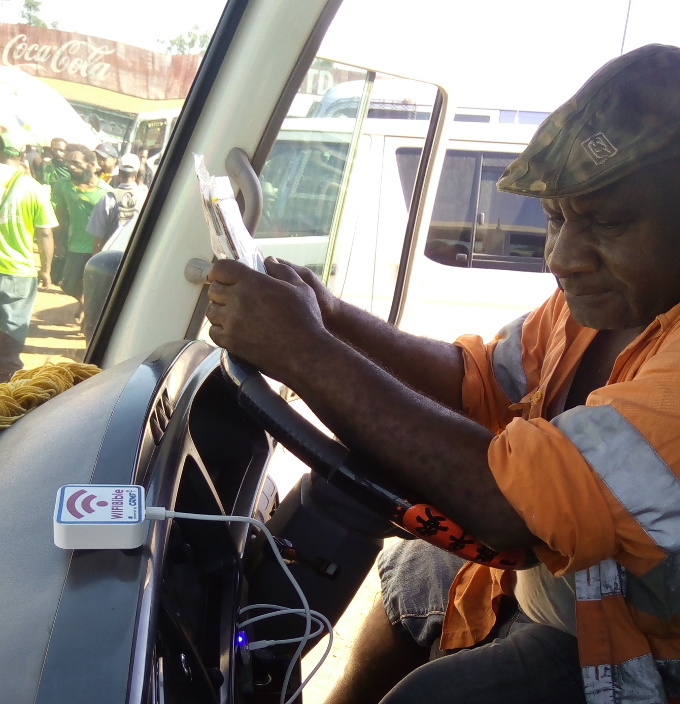 In our earlier story titled “Privileged Passenger” we concluded with this statement – We thank the bus owners who are willing to partner with Jesus to reach out to their own country men and women by allowing CRMF to install WIFIBible devices on their vehicles. We appreciate MAF Netherlands for the support and prayers by putting a WIFIBible device on public vehicles to entertain passengers for a greater trip. This installment on the AGAPE bus was the first of the twenty devices that MAF Netherlands sponsored and by the time we visited the central bus stop twice the team was able to install a total of nine new installs in a week! We started off by giving out the free advertisement posters of the twenty free installs and they couldn’t believe it, asking us again if it was free, they even asked for the price because they could not believe the poster! We assured them that it has been paid off already and all they need to do now is say YES for the device to be installed! Fuzzy Wuzzy was next! Fuzzy Wuzzy bus named after the famous war carriers on Kokoda Trail in World War 2 does the Goroka Hagen Goroka route. Its crew members confused the WIFIBible Device with an mp3 player and we had to explain it plainly to them that it is not, it’s like connecting to the internet with phone data but this is better, it does not need data connection and will not need your credit either. All the resources are loaded and available for you to download and share for free. Six Pocket was next to fully understand that it was free! This bus which does the Goroka Hagen Goroka route is named after the popular six pockets shorts that everyone likes to wear in Papua New Guinea. This install was more fun than the other two, the bus driver and the crew were so excited to have it on their bus. While the device was still booting up and the driver was shown how to use it, the crew were already fighting over who is going to put on the stickers on the bus! Some of the crew members are not even permanent workers for Six Pocket Bus Service but this is one way where our people share together; even in a brief moment together looking serious as crew members for the camera man. The driver even wanted his own picture with the device and he couldn’t stop totting the horn while we were taking a picture of the crew. When we returned to the CRMF’s Communication Centre, one of the Hagen based bus followed the team and asked for installation. It was an exciting experience with all these installs, and there are 10 more left to install. 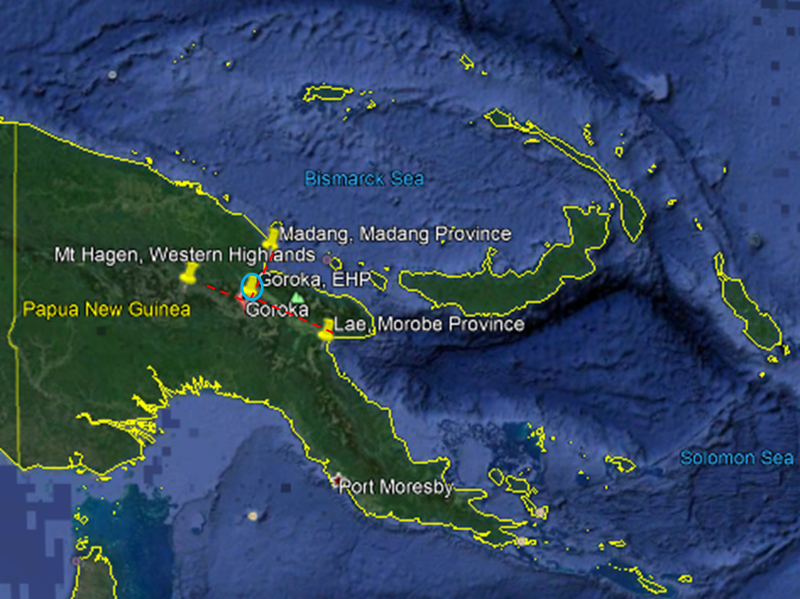 Most of the highway buses from the upper highlands areas and the coastal areas travel between Goroka. The upper highlands areas include buses mostly from Mt Hagen in Western Highlands Province, and a few from other upper highlands areas. The coastal routes include Lae the second city in Papua New Guinea and Madang in the Madang Province which is north of Goroka. We thank the Lord for the strategic location here in Goroka, Eastern Highlands Province, because our location is central to the bus routes that go higher into the highlands and lower to the coastal towns of Lae and Madang. 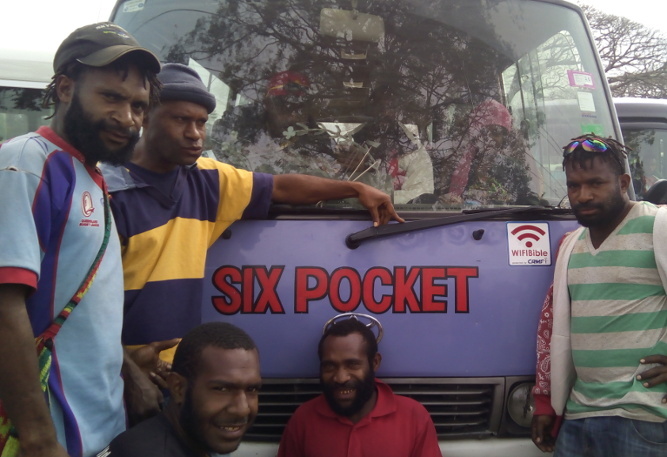 The team’s plan is to visit the Goroka bus stop again next week and install the remaining 10 devices. 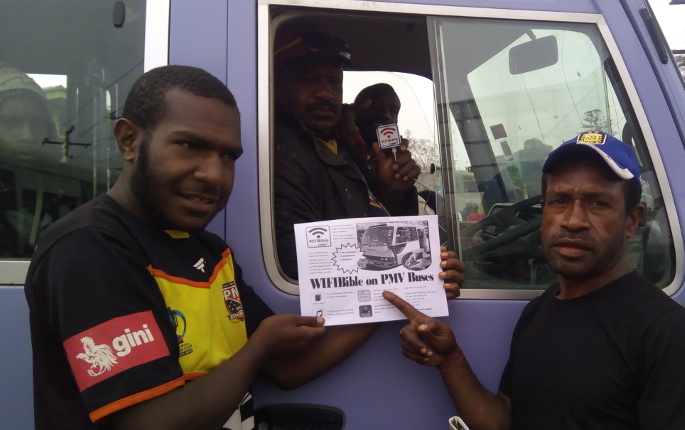 Please pray with us as we would really love to cover the Lae Madang route, as we have had fun seeing the crew members fighting to put stickers on their buses, ha-ha, but on serious note give every opportunity for the traveling public to hear the Good News of our Lord Jesus Christ.